A must have for anybody starting out on their EC journey. Filled with visuals, how-to's, and troubleshooting sections, it will equip you with the knowledge to potty like a pro. Got a little one who is 18+months? The Tiny Potty Training Book will give you a clear outline of how to potty train simply, easily, and gently. An adorable story about a baby and a trip to the potty that normalizes the routine for children. Perfect for children 6 months to 3 years old. Help your child stay dry all through the night by reading this book before bed. 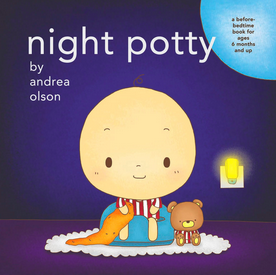 The story reminds children how to wake to pee and use the potty themselves. Got a tiny baby bum that needs some coverage? Grab these 100% cotton, sweatshop-free undies. A variety of prints and colors sizing from 6 months to 5T. These luxurious bamboo fleece trainers are a convenient and stylish way to keep your floors and child's clothes dry while doing EC or potty training. Use with Tiny Trainers for even more protection. 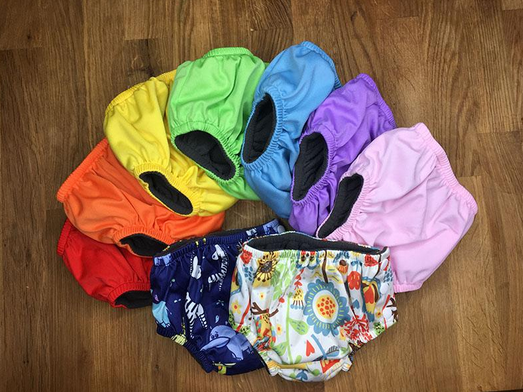 A 100% cotton, sweathshop-free training underwear for EC or potty training. Will stop any little leaks while your child is learning. Use with Tiny Ups for even more protection on outings or nighttime. A comfy and convenient solution for pottying a newborn. Great to throw in your diaper bag or have handy around the house for a quick potty break. Made from recyclable and BPA free plastic. Going out and about? No problem! This portable potty is compact enough to fit in a diaper bag and can be used on the toilet seat or stand alone. Comes with disposable bags for quick cleanup on the go. Perfect for pottying in the car! This toilet seat has just enough cush for that tiny little tush. My go-to for smaller babies to keep them secure, comfortable, and steady on the toilet.